Sitting atop a grand staircase in the center of town, the Cathedral of St. Andrew in Amalfi is one of Campania’s architectural highlights. 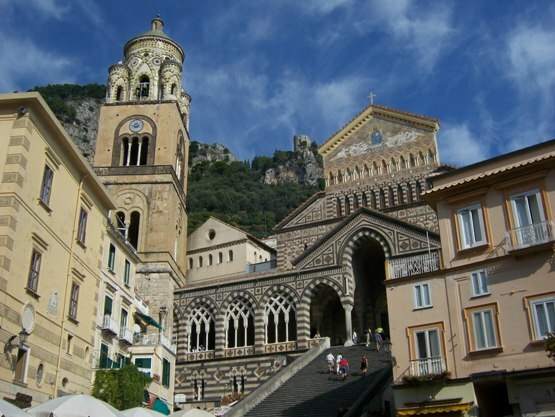 First time visitors to Amalfi often stand in awe when they first catch sight of the stunning Cathedral of St. Andrew. 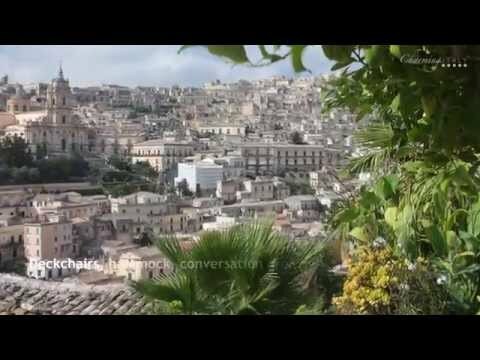 The Duomo, as it is usually referred to in town, is the religious, historic and cultural heart of Amalfi. Its role in the daily life of the Amalfitans is just as important now as it has been for centuries. 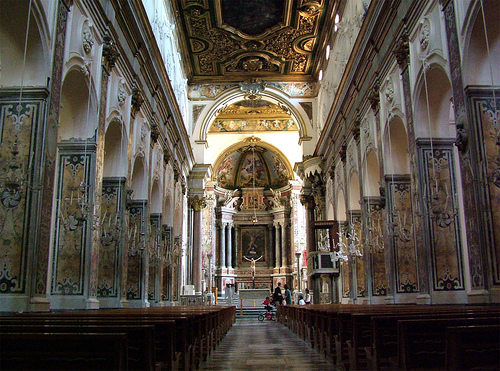 The Cathedral is home to the relics of Sant’Andrea, or St. Andrew, who is the patron saint and protector of Amalfi. Even if your visit to the Amalfi Coast is short, you’ll want to be sure to explore this beautiful church during your stay. Climbing the Duomo’s grand staircase, you’re greeted at the top by a magnificent set of bronze doors dating from c. 1061. 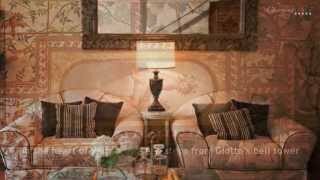 They were a gift from Pantaleo de Maurus Comite, a wealthy Amalfi merchant working in Constantinople. 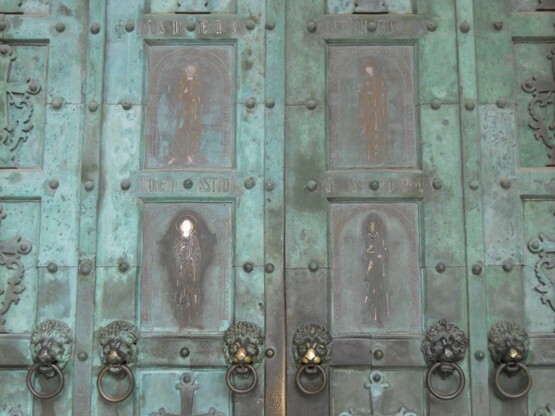 In the center of the door are four figures representing Christ and Virgin Mary and below St. Andrew and St. Peter. These impressive doors are the first hint of the splendors waiting inside the church. Whitewashed and surrounded by interlacing Moorish arches supported by 120 graceful marble columns, a sense of calm fills the tranquil Cloister of Paradise. 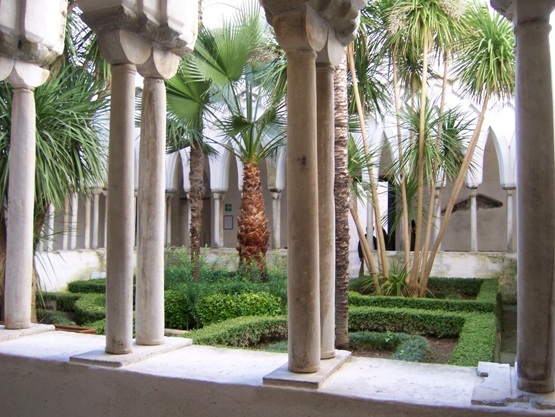 This beautiful cloister was built between 1266 and 1268 as the cemetery for the nobles of Amalfi. The deep greens of the pretty Mediterranean garden in the center of the cloister contrast wonderfully with the delicate white columns. Stop on the northern side of the cloister and look up to see the 13th-century campanile (bell tower) of the Duomo perfectly framed in one of the pointed arches. Surrounding the cloister you’ll find many Roman sarcophagi, some carved with detailed scenes and intricate designs. There are also beautiful mosaic covered pieces of a Byzantine pulpit that was once located in the nave of the church. Many 14th-century frescoes have been preserved in the chapels surrounding the cloister. Before leaving, take time to stop and feel the quiet beauty of the Cloister of Paradise, which is surely one of the most serene spots in Amalfi. From the Cloister you enter the Basilica of the Crucifix, which was the first church on the site dating back to 596 AD. It was the primary church in Amalfi until the current Cathedral was built in 1100. 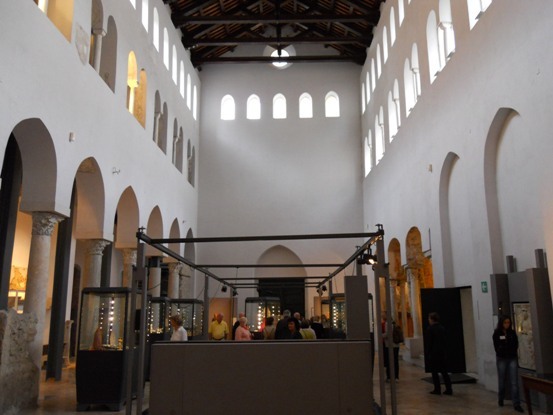 Now you will find the Cathedral Museum located in this beautiful medieval space. Spend time seeing the many artistic treasures, including a precious 13th century Angevin Mitre and Chalice, and the important statutes, reliquaries and religious objects on display. A staircase in the Basilica of the Crucifix leads down to the Crypt of St. Andrew. In May of 1208 the relics of St. Andrew arrived in Amalfi, and since then they have been preserved in this lavishly decorated crypt. 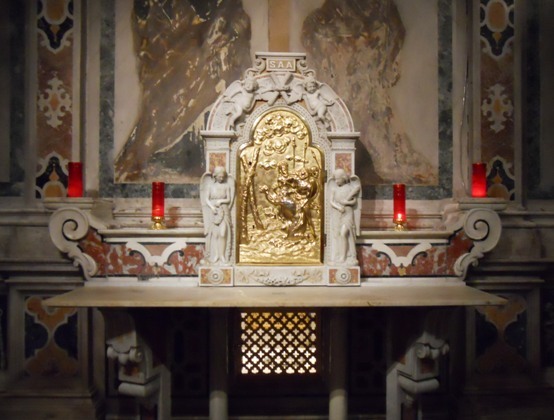 Behind the main altar is a small and richly decorated case that contains the skull reliquary of St. Andrew. The rest of the saint’s relics have been buried below the altar, which is topped by a large bronze statue of St. Andrew created by Michelangelo Naccherino in 1604. Climbing the stairs from the crypt takes you to the stunning Cathedral, with its sumptuous Baroque interior dating from the 18th century. Walk down the center aisle and look up to see the coffered ceiling with paintings showing scenes from the life of St. Andrew. The central apse is supported by two ancient granite columns that were found at the Greek ruins in Paestum. Before leaving stop and see the 16th century silver bust of St. Andrew and an impressive cross made of mother-of-pearl. Once out on the atrium, you’ll be treated to a fine view looking over Piazza Duomo. You’ll see this little town with different eyes when you step outside after having seen the magnificence and wealth of the Duomo of Amalfi. MY WIFE AND I WILL BE VISITING THIS AREA IN OCTOBER OF 2012 . WE WILL BE CELEBRATING OUR 38 WEDDING ANNIVERSARY. I WOULD LIKE TO KNOW IF WE COULD RENEW OUR WEDDING VOWS IN THE CHURCH OF SAINT ANDREW. IS IT POSSIBLE TO GET A DATE TO DO THIS.